**There will be a vigil commemorating the death of Tamir Rice TODAY in Asheville, 3pm at Carrier Park, on the 1 year anniversary of his death. This 14 year old African American boy was gunned down without consequences to the cops who killed him. People will be meeting at 3pm, at the end of this show at Carrier Park off of Amboy road.. Come and support Black Lives Matter and demand justice. Please spread the word and bring flowers and signs against the death of Black people by Law Enforcement in the U.S. 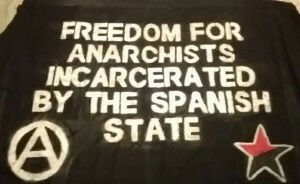 This week on the show you’ll hear an interview that Bursts conducted with a comrade living in Spain regarding Operation Pandora and Operation Pinata, two government initiatives specifically designed to target and incriminate anarchists. In this interview, they get into how these initiatives operate, the real life implications of targeted governmental oppression, security culture and much more! To learn a little more about this topic you can visit http://en.contrainfo.espiv.net and search “Pandora, Pinata, and Beyond”. First though, you’ll hear some words from Nyki Kish, incarcerated at Grand Valley Institution for Women in Kitchener, Ontario, Canada. This is a segment of a reading of Nyki’s 4th recent blog entry concerning persecution of non-cis-heteronormative prisoners at GVI. We announced about this last episode. There’s a call-in-campaign ongoing to get the GVI to stop the repression. More information and updates on the Grand Valley Institution for Women and struggles there, check out https://gviwatch.wordpress.com/ and join the call-in campaign by dialing 519-894-2011, requesting to speak to the acting warden at GVI and inquiring why they are criminalizing LBTQ2+ prisoners. Or you could fax 519-894-5434 with similar requests. The warden has announced the allowance of a LBTQ2+ group to be formed among prisoners there, but the campaigners suggest continuing to call and fax to see if they follow through and what comes next.